I’ve been pretty busy recently but I managed to squeeze in some time on my 50 sharks project recently to finish up the Junker Shark! I think this might have been my favourite one to do so far because it pushed my technique but also pushed me creatively which is one of the reasons that I stared this project because I feel like I lost my imagination a bit over the last year or so and it’s something that I used to be really good at. I wasn’t quite sure where to take this idea when I first started, I had the idea of combining the shark with pieces from various different vehicles and equipment, mainly boats, because I felt like those fit the environment more and made the whole thing more believable. When I was looking for reference I came across a photo of a really cool car so I decided to go with car parts in the end, but from the research that I did it’s definitely made me want to do a few more of these Junker Sharks with different body parts! I really wanted to challenge myself with this one, especially with the colouring, so I decided to try and use a different lighting angle to what I usually do and to also steer away from having such a blue tint to my colours, even though I kind of ended up giving it a blue tint in the end! I also wanted to include some kind of neon glow in the illustration which I did through the jellyfish and the nuclear waste. Keeping the metals rusty and scratched helped add some texture to the image too and gave it more of a believable feel. Once I started to really get to the final stages of the image I needed to think more about the story behind the shark, so at first, I thought that I wanted the shark to be in the dark depths of the ocean so that the whole illustration was super dark, apart from the shark itself. However, I felt like it was a little boring and there wasn’t really enough atmosphere in the image overall, so instead I decided to add some natural light into the environment which completely changed the tone of the image. It still looks creepy and dark, but because of the natural light, it instantly becomes recognisable as being in the ocean. 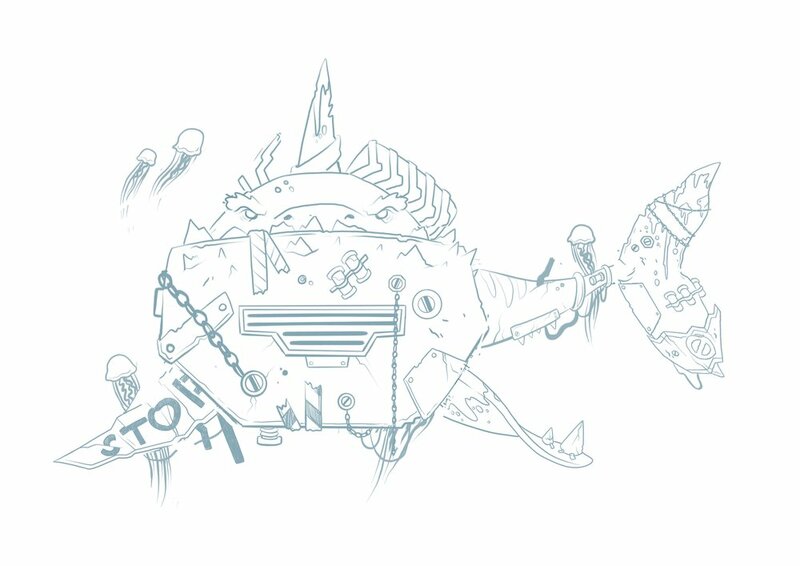 As we all know, I also really like to make sure my illustrations have some depth to them too, so I thought I’d play around with the idea of floating rubbish behind the shark because something that I’m constantly aware of when I’m taking the rubbish out is the amount of rubbish that ends up in our oceans due to a documentary I once watched. So although I mainly put the rubbish in there to add depth, it’s also quite fitting because of what it represents, especially with this already being a project to eventually raise some funds for charity. I’ve been trying to become more aware of my thought process when I’m creating an image lately, and I think it really paid off in this illustration and pushed my skills and style that little bit further! I’ll also be uploading a video to go along with this on my Youtube channel next week. Feel free to let me know what you guys think of the final illustration too! Tutorial - Creating an original character from reference.